Sasha is 12 and lives in St. Petersburg. He’s a 6th-grader. His life is quite similar to yours: he goes to school, meets up with his friends, goes to the cinema. Quite obviously, he also needs to eat every day to have energy for all the exciting things he does throughout the day. And what does he usually eat? However, before I introduce you to the wonders of Russian cuisine, let me show you some typical Russian ingredients. You might not be familiar with them, but they are present in many Russian recipes, so it would be good to get to know them first. sgushonka (сгущёнка) - sweetened condensed milk. An essential ingredient in many Russian desserts, but also eaten on its own. Can be found in any Russian fridge. There are a few Russian dishes that Sasha eats for lunch (at midday) or supper (in the evening). Bliny / блины. Bliny are Russian pancakes. They can be both sweet (served with sgushonka, tvarog, chocolate, fruit or jam) and savoury (filled with meat, cheese or vegetables in different combinations). Bliny are extremely popular in Russia. In fact, there are whole cafes that specialise only in bliny. Selyodka pod shuboi / селёдка под шубы. The name of this dish translates as “herring in a fur coat”. 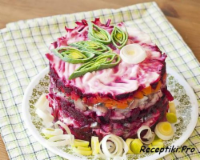 It is a salad made of layers of diced herring covered with a “fur” of diced boiled potatoes, carrots and beetroots and mayonnaise. Borshch / борщ. Borshch is a warming, red soup originating in Ukraine, but very popular in Russia. It is cooked with beetroots, potatoes, bell peppers, mushrooms, onions, carrots and sometimes (but not always) some meat. It is served with a spoon of smetana and some dill. 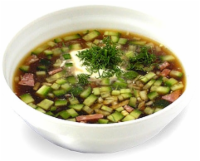 Shchi - cabbage soup / щи. Apart from cabbage, shchi is made of carrots, parsnips, celery, onions, garlic and pepper. It can also contain some meat. Just like borshch, it is served with sour cream and dill. Another version of this soup, called “sour shchi” (kisloe shchi) is made with pickled cabbage. Ukha / уха. A thick fish broth made with any type of fish, potatoes and other vegetables. Solyanka / солянка. A sour and salty soup. 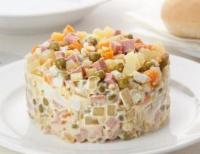 It contains some ingredients that are not typical for Russia, like olives and capers, and some ingredients that are very Russian, like pickled cucumbers and pickled mushrooms. One of its most important ingredients is ham - this is where the salty flavour of the soup comes from. 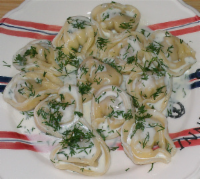 Pelmeni / пельмени. Pelmeni are little Russian ravioli filled with different kinds of raw meat spiced with onions, garlic, salt and pepper. 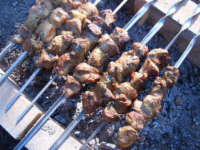 This is another of Sasha's favourite dishes. Usually served with smetana and dill. Kotlyety / котлеты. Little Russian pan-fried burgers. Very popular and very easy to make. You'll find the recipe below. Plov / плов. Plov is a Russian version of risotto. Layers of meat, onions, carrots and mushrooms cooked together in a big pot. 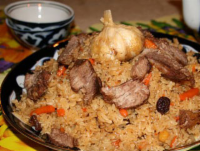 This dish comes from Uzbekistan, but is very popular in many Russian households. 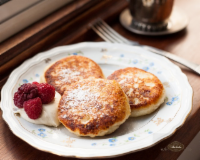 Oladushki / оладушки - little yeast pancakes, usually served with jam, smetana or sgushoka. 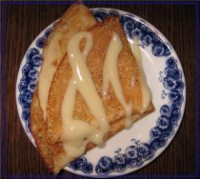 Syrniki / сырники - little tvarog pancakes served, just like oladushki, with jam, smetana or sgushonka. Now it is time for you to cook! Let us prepare a two-course Russian dinner. Remember that cooking can sometimes be dangerous, so you will need a grown-up to supervise you! dill and sour cream (you can find Russian-style sour cream in Polish shops and in the Polish sections in supermarkets). 2. Grate the beetroots and the carrot (remember that beetroots can stain your hands. Use rubber gloves to avoid that). 5. Put the chicken stock in a big pot and warm it up (you don’t need to boil it). 6. Put all the vegetables, beans, canned tomatoes and bay leaf, in the pot and let it simmer on small heat for around 45 minutes. 7. Add garlic, sugar, vinegar, salt and pepper to taste. 8. In the meantime, chop the dill. 9. 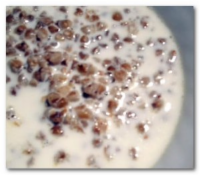 When the soup is ready pour it into bowls, add a tablespoon of sour cream in each bowl. Sprinkle the soup with chopped dill. 10. Your home-made borsh is ready to be served! Time for the main course! We will prepare kotlyety. You can serve them with potato puree and pickled cucumbers. 1. Soak the roll or the baguette in milk. 3. Fry the onion golden brown. 5. Put meat, egg, garlic, fried onion, chopped dill, soaked roll, salt and pepper in a big bowl. 6. Combine everything until nice and smooth. 8. Cover each kotlyeta in bread crumbs. 9. Fry in vegetable oil on medium heat until crispy and brown (approximately 5-7 minutes on each side). 10. Congratulations! Your kotlyety are ready to be served! Do like cooking? 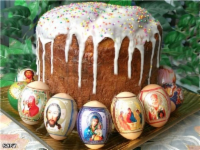 Try the recipes we've suggested or look for other Russian recipes and then send us your favourites, with a picture of the dish you cooked, and we'll add them to this page.